Downstairs is the preserve of Mr Pallister. Below you will find his notes on a butler's general duties, dealing with guests, dealing with a house party of gentlemen, and the delicate subject of Visiting Persons. In all establishments the butler’s first duty is to rule. For under-servants are never comfortable, much less happy, when lacking firm management. Indeed the master himself and the rest of the family as much as the servant members of the household accrue untold benefit from the judicious exercise of a butler’s proper responsibilities. It follows naturally that a butler must be a man of irreproachable character, fully versed in all manner of affairs and able by the suavity of his manners and equable deportment to sustain the reputation of his master and ensure the perfect behaviour and therefore comfort and happiness of the entire household. In these modern days, even a servant in the best of situations might find himself asked to announce and wait upon a guest whose station in life is markedly at odds with the standing of the household he serves. A doctor, a minister, even a lawyer, the likes of whom would have been dealt with in the business room a generation ago, might now be shown into any reception room in the house and might stay to luncheon or dinner with the master or be included in the mistress’s tea. It goes without saying, that scrupulous courtesy is extended to any visitor at all times. Nevertheless, if a servant and in particular a butler, shows an excess of deference to a professional man - makes no distinction between a duke and a doctor - he prostrates himself both unnecessarily and unbecomingly and, in the end, traduces the honour of the family to which he owes his first allegiance. So, while warmth of demeanour and an affable expression should be xtended to those guests whose demand it by virtue of rank it is quite possible, and indeed fitting, to maintain the proper distinctions and preserve the decencies when faced with persons of other kinds. No details are required in this respect: the good servant can supply them for himself. One special kind of visitor, however, does merit an extra word or two. There are ways, long established and proved by experience, to handle such minor awkwardnesses as the best of masters might present, for a man is a man when all is said and done. The difficulty arises with the mistress and cannot be overlooked in the same way. A gentleman caller upon the lady of the house when the master is absent is not a pleasant matter for a good servant to face but cannot, regretfully, be avoided unless one’s master and oneself are luckier than most these days. In such unfortunate circumstances, a butler’s concern is to represent moral rectitude and to champion the absent master of the house. This can be achieved without any reduction in courtesy and is always effective. The butler is the most senior member of the household staff and yet none of his subordinates could envy him his place for he works harder than all the other department heads taken together. In the morning he must give out to the footmen what plate and other silver ornament requires to be cleaned. He must oversee the setting and clearing away of breakfast and must be on hand to ensure the valet’s proper care of his master’s wardrobe. During the morning, the butler ensures that all fires are properly attended in the dining room, drawing room and other sitting rooms and, in the country, has responsibility for the collection and distribution of letters from the mail-bag. Once again at luncheon-time the butler must oversee the setting and clearing away of the table and if few footmen are employed might also help to serve. In the afternoon, a good butler will remain in the front hall to admit and announce visitors and will be on hand to manage the serving of tea. When evening comes a butler must oversee the lighting of lamps and thereafter ensure their attendance by footmen. He will announce dinner, remove covers at the sideboard, and arrange successive courses until desert is served whereupon he may depart to take tea. Before retiring, a butler must lock away the household plate, ensure that fires are safe and that the doors and windows of the house are securely fastened for the night. For those few moments of rest to be found in a butler’s day he is furnished with a chamber - a pantry - wherein as well as briefly reposing he carries out the most important of all his many duties: the management of the wine cellar. Of this crucial area in household economy, more another time. When the lady of the house is away, and the gentleman is of the sort who makes his friends among bachelors and sportsmen, a butler will sometimes find himself in charge of that most amiable and pleasant of gatherings: the gentlemen-only shoot or fishing party. The actual shooting or fishing is the preserve of the outside servants, of course, and I daresay these elements of the party all but run themselves. The cook too has an easy time of it, with a menu dictated by the catch or the bag. The butler, however, will find such occasions even more full of tasks and toil than every other that might be mentioned, and to rise to the challenge and have the visit go off smoothly is one of the most rewarding endeavours in a butler’s life; one which he can congratulate himself upon without danger of conceit. There will be visiting valets to organise, as well as household menservants to share amongst unvaleted guests. The laundry maids must be well-warned in the matter of drying the tweeds after a wet day, and the hall boy and boot boy must be watched carefully to see that they are collecting, drying and cleaning the boots in time for each day’s sport. Just as important is to guard the running of the household against the threat of being swamped by the special tasks which a shooting or fishing party brings. For instance, no amount of plucking of game or cleaning of fish should get in the way of the essential daily round and the butler must be wary of the self-regarding cook who will often try to inveigle footmen and maids away from their appointed jobs. The butler is responsible, too, for making sure that none of the ghillies disrupt the proper running of the servants’ sphere; it is all too common for a ghillie with a gun to clean to imagine that he can take over a portion of a boot room, a flower-room, a servants’ hall and even a scullery to set out his stall. A butler must be firm at all times. One of the most important tasks for a butler on these occasions is to serve the morning refreshments taken in the hall or on the sweep, and to hand the position finders to the master for distribution among the guns or rods. If picnics are to be taken away from the house during the day the butler might even be called upon to accompany them and oversee the serving. After such an extra-ordinary demand on a butler’s time, an understanding master will not expect him to take on the supervision of tea and dinner as well, but will accept those jobs falling to an upper footman instead. For the avoidance of any doubt, this material is not of my hand nor to my taste. It makes you fit and keeps you well-ee. On food they give to parrots. On boiled beef and car-rots! The young men say, "Ah, there you are!" And Pa says, "That's peculiar!" Oh pierce me through the heart, why don't you? For everything else is torn in two. It has been necessary once already in these annals to touch upon the matter of guests whose social standing, whose family background, whose very class, mounts a challenge to the usual order in a household which is accustomed only to entertain ladies and gentlemen. Doctors, lawyers and other professional men present difficulties enough, as was touched upon in my earlier writings. When it comes to female persons who are not ladies, the challenge is doubled. When such individuals present themselves at times when the mistress of the house is from home, few are the butlers in the land who could chart such choppy waters and see the visit through with all unharmed. Governesses, where experience is held of that sort of woman, will form a useful template which can be adapted to manage gently-born seamstresses, nurses above the rank of sister or nuns of any kind. In particular, the sleeping quarters offered to such females must be nicely judged; one of the better servants' bedrooms with its own corridor door and a pleasant view will suffice. If none such is available then a cadet's bedroom with no view and on a separate floor from the family and other guests will make an adequate alternative. Meals should be taken in the sleeping quarters if such can be arranged, excepting breakfast where a visiting person will hardly discommode the family by joining them. Luncheon, tea, dinner and supper can be taken up on trays or the person can eat in the servants hall before or after the servants' meals as the cook decides is convenient. 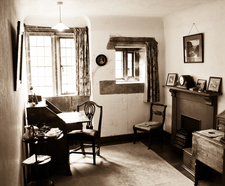 If the bedroom is small or the servants' hall unsuitable, perhaps where it is combined with other purposes and an addition would interrupt these or distract lower servants form their duties, any small unused chamber on the ground floor with plain furnishings and no front view can be appointed for dining. Needless to say, any visitor, even a visiting female of this sort, will be accorded the utmost hospitality by all.